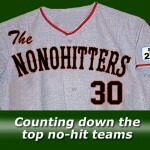 Twenty days until opening day, so we’re highlighting the 20th team on our NoNoHitters 30 countdown, the Miami Marlins. The team, which went by the name "Florida Marlins" for the franchise’s first 19 years of existence, has five no-hitters since joining the National League in 1993. Al Leiter threw the club’s first in 1996 during a home game against the Colorado Rockies. He was followed by Kevin Brown, A.J. Burnett, Anibal Sanchez and Henderson Alvarez. Alvarez’s 2013 no-no was a interesting one, in which he was in the on-deck circle in the ninth inning of a 0-0 game when the Marlins’ game-winning run scored on a walk-off wild pitch.